The overall fit/size of this new style seems “true” to their published size chart (see below), so if you are comfortable with a certain size from previous boots, then choose the same size. I’d consider the width of the men’s sizes to be normal to slightly wide (D or E). 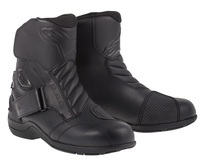 PS: Alpinestar’s description mentions protectors on each side of the ankle. The sides of the boot are heavy duty for sure, but…. I see a rubber vent-looking piece on the outside, but I’d hardly call it a “protector” and I’m having a hard time feeling anything under the leather on the inside of the ankle. There probably is, but I can’t feel it and I thought I’d mention it in case you get a pair and can’t feel it either… you aren’t alone!